D’oh!! The Simpsons have been around for twenty years now, and Microsoft’s Word’s Spell Check still doesn’t recognize “Simpsons” as a real word. Ay Carumba! My quibbles with spell check aside, let me just come out and say this: “The Simpsons Movie” is undoubtedly a comedy Masterpiece. It’s everything you could ever hope a Simpsons movie to be, and then some. It’s been 18 years coming, but the film is well worth the wait. Groening and the Simpsons creators have been busy at work on “The Simpsons Movie” since 2001, determined to make a movie that thrilled and delighted both devoted Simpsons fans and casual moviegoers alike. They succeeded brilliantly. Rarely do we get to know about the creative process of a movie before it comes out, but Groening has given lots of interviews about the film and how it came to be. Apparently, while the official pre-production didn’t start until 2001, the writers and staff had spent two years trying to come up with a larger-then-Homer plot and ways to make “The Simpsons Movie” stand out from the rest of the Simpsons legacy. Again, I don’t what to give away the plot, but they definitely did things with it that couldn’t be done on TV. It must have been ridiculously hard to come up with a plot that let Simpsons make the jump from TV to the Silver Screen, but the plot they designed could only be executed by way of a Movie. They spend time setting up little sub-plots that eventually weave themselves into the main story arc, and have all the main family members go through character development along the way. The plot is helped by more technical aspects that could also never be executed on TV. For one, the film was filmed in a 2.39:1 aspect ratio, which is very wide and panoramic. They fill this width with beautiful shots of Springfield, Nature, and crowds. The crowd shots are a joy to watch, as they contain cameos from pretty much every single supporting character/guest character to ever be on the Simpsons, and for those of you (like me) who have seen most, if not all, of the episodes, you’re going to love the crowd shots. Some early reviews have claimed that many of the great supporting cast wasn’t in the movie enough. I don’t agree with that at all. Many supporting characters have great scenes, and while none of them get even a fraction of the screen time the Simpsons family has, the movie still has more supporting cast appearances than any episode ever has. They did an absolutely excellent job of including the people of Springfield as much as possible. The animation is also really, really good, while still retaining that amateurish quality that gives the Simpsons its charm. The animation is simplistic, but the colors are beautiful and there’s a lot of depth to the image. This is enhanced by a rousing film score by Hans Zimmer. The score takes itself very seriously, which adds to the humor of many scenes. The voice work is better than it’s ever been. Dan Castellaneta gives life to Homer, putting lots of humor and emotion into the iconic role. Julie Kavner deserves special recognition for making Marge a more heartfelt character than she’s ever been before. Her performance is really very touching and emotional in a few key scenes. The rest of voice cast, including Hank Azaria and Harry Shearer, who voice the majority of the supporting cast brilliantly, do some of their best vocal work ever. But the most important thing about this movie is that it’s probably the funniest movie of the year. Since roughly 2000, the Simpsons on TV has become stale, repetitive, and just not funny. There have been a few good episodes, but the majority of the newer episodes have just been lame. “The Simpsons Movie” manages to re-capture the true essence of what made the first eight or nine seasons great, which is a rapid-fire wit that makes plenty of great pop-culture references, mixed with hilarious sight gags and clever lines and sequences that will give you chest pains from laughing so hard. It’s funny any way you see it, but seeing it with a huge crowd will enhance the experience, and I suggest you go see it at night when there are large crowds. A theater full of laughing people makes for an even funnier night at the movies. As a final note, some people (myself included) have expressed doubts about the movies 87 minute run time. Yes, the film is short. But it feels just as long as it needed to be. If it had been too long, it would have been boring. 87 minutes is the right amount of time needed to tell the story, and when watching the movie, it becomes a non-issue. So grab your pink doughnuts, get some buzz cola, and get ready to laugh harder than you have in a long time. 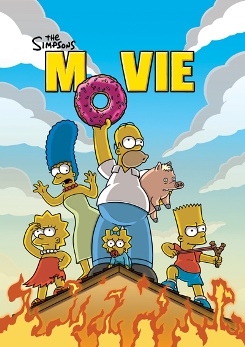 “The Simpsons Movie” is a movie you can’t afford to miss. Oh, I forgot to mention....Eat My Shorts, Spell Check!! !